Microdermabrasion is a non-chemical, non-invasive procedure that uses a spray of microcrystals to remove the outermost layer of dry, dead skin cells and reveal younger, healthier-looking skin. Microdermabrasion is a noninvasive, skin resurfacing procedure that gently exfoliates or polishes away the top layer of dead skin cells, while stimulating collagen growth, to reveal healthy new skin that looks and feels smoother. Fine lines, blemishes, dull skin and sun spots can be improved, especially with regular treatments. Products such as moisturizers, creams and lotions are more easily absorbed and therefore more effective after microdermabrasion treatment. This is a painless, low-risk skin treatment that can be added to your beauty routine. The technologies used today are either specialized tools that shoot a stream of tiny crystals, or a diamon-tipped wand. Both aim to remove the Stratum corneum. Diamond and Crystal dermabrasion have their unique pros and cons but at the hands of a good operator you will get similar results. The treatment of microdermabrasion can be performed by a physician, a nurse, aesthetician, or other trained medical personnel. It is recommended for patients to consult a dermatologist or medical aesthetician before starting any resurfacing treatment. Careful evaluation on the patient's skin for changes in texture, severity of photoaging, depth of scarring, and the type of skin from a specialist will help patients select the proper resurfacing modality in order to address the skin. This advanced treatment can be used as a stand-alone maintenance treatment or upgraded as a booster treatment to most relaxation facials. For best results, we recommend a series of gentle Micro treatments, with treatments scheduled 7-10 days apart. Each procedure takes approximately 45 minutes to perform and there is no downtime for the skin to recover. · Subcutaneous tissue - The bottom layer that contains fat and larger blood vessels blems effectively. Your skin is constantly shedding dead cells to make room for growth and to clear toxins. However, some cells stay on the surface of the skin and can cause a dull or rough appearance. 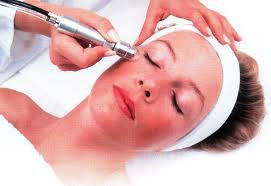 Microdermabrasion works by scraping or blasting these cells away to clean and rejuvenate your skin. 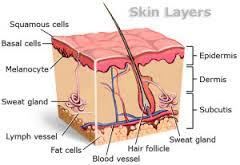 There is actually a fourth, false layer of skin that you have. This layer (referred to as the stratum corneum) is where small wrinkle and lines begin to form before they dig deeper into the layers of your skin. The false layer of skin should be removed as it can prevent the skin from breathing properly and reduce the effectiveness of other methods of skin treatment. Microdermabrasion's sole purpose is to remove this layer of skin while leaving the lower layers unaffecting. Of course, in professional settings, microdermabrasion can go even deeper to remove scar tissue and stretch marks. · It isolates a certain section of your skin for deeper cleaning (like a vacuum cleaner attachment). · It can also serve to raise unwanted cells and impurities from the lower layers of your skin. · It allows the crystals to work solely on the isolated section of the skin and makes treatment sessions shorter. · It collects and disposes of any materials that are freed from the skin. 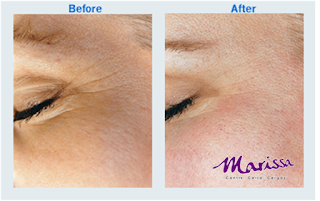 From minimizing fine lines to improving your pores, microdermabrasion provides many benefits. It is one of the three most commonly performed dermatology treatments in the United States, and its relatively low cost makes it a practical choice for patients with minor skin problems and early signs of aging. Microdermabrasion may be very useful for people with active acne, mild acne discoloration, pick marks, and very superficial or raised acne scars. Dermatologists use microdermabrasion to help unclog pores and clear acne. Often used in combination with gentle glycolic peels and medical acne extractions, microderm can help speed up acne clearing. One of the most common side effects of microdermabrasion is redness of the skin or treated area. This is caused by the treatment; as the crystals begin to rub away at the skin and remove dead particles, the skin can become irritated and red. The redness can be worse in people who have existing skin problems with acne. Acne bumps or open sores may become more irritated and reddened after the procedure. Areas with acne that is cystic or weeping with blood, pus or fluid should be avoided and treatment revisited once the skin has healed. If the microdermabrasion is being used to treat common acne, purging can occur. This is where the pores open up in response to treatment and can cause the acne to temporarily get worse. As the skin repairs itself, the acne outbreak should also resolve within a week. Rarely, redness is caused from an allergic reaction or sensitivity to the crystals or the friction of the treatment. · Redness is the most common side effect. Usually, it's similar to a mild sunburn. For most people, the redness fades after just a few hours. · Dryness or flakiness in the days following a microdermabrasion treatment isn't unusual, and typically resolves within a week. If you have very oily skin, you might welcome the fact that your skin isn't as oily as usual. · Microdermabrasion also can increase your sensitivity to the sun (photosensitivity). Make sure to wear your sunscreen! Because microdermabrasion works only on the superficial layers of the skin, serious side effects are very rare. Your risk is very small if your microdermabrasion treatment is being done by a skilled and conscientious technician. The greatest advantage of microdermabrasion is that there is no recovery time for this treatment, so the patient can perform his daily activities immediately after the treatment. Also, microdermabrasion is a completely painless procedure and the patient can see the result immediately after the treatment. The low cost and safe nature of microdermabrasion makes it a very viable method of skin treatment. Scars and stretch marks can also be readily removed in a medical setting. However, the applications of microdermabrasion are generally in the upkeep and prevention category rather than the actual treatment of skin conditions. You do not need to see a doctor before beginning a microdermabrasion program but a professional may be required for more intense sessions. Consider whether the value of prevention techniques outweighs the cost of later skin treatment methods when deciding whether or not you would like to invest in a microdermabrasion treatment. With home methods available at lower prices than many other treatments, you can try several products or types of microdermabrasion before investing in more expensive medical treatments. While you may not see immediate results, avoiding a chemical peel at a later point may make microdermabrasion a logical skin treatment method. Coupled with the low cost, if you are looking to perform a skin treatment procedure that will provide reasonable results and can be performed fairly quickly, microdermabrasion may be right for you. Microdermabrasion with ultrasound is a combination treatment that brings the best of microdermabrasion and ultrasound treatments. It is a minimally invasive treatment that can correct a host of skin conditions.